Some parents are not aware of dangers of internet that brings to their children particularly making friends through internet. For example, their children might get cheated with someone else on internet and their children will not tell what happen to them when they encounter danger. According to BBC News, a 47 year old man defrauded a 13 year old girl online and asked to meet face to face. Luckily, the girl’s mother found out beforehand or else her daughter might be in danger. From this news, we can see that there internet friends are not always honest and they are more likely to consider as un-trustful strangers. Therefore, parents should concern more about their children, teach them about the dangers of making friends on internet, and avoid them from going out with a stranger. This article is available for download as a free ebook. Click on the button to join my free newsletter and download the ebook. “Hi-Bye” friends (or acquaintances). These are the ones you see at school/work because the context calls for it. You say hi when you see each other and you say bye at the end of the day, but that’s about it. The relationship never lasts when the context is removed, i.e., when you graduate from school or leave the workplace. Regular friends. Social, activity buddies you meet up every now and then to catch up or hang out with. You can generally talk about regular topics under the sun. True, soul friends (or best friends). People you can talk anything and everything with. You may or may not meet up every day, but it doesn’t matter as the strength of your friendship is not determined by how frequently you meet up — it’s more than that. These are the friends you can trust to be there for you whenever you need them, and they will go the extra mile for you. Most of us are looking to make regular friends and if possible, true, soul friends. We probably have a lot of hi-bye friends — more than we can count. The ratio of my hi-bye friends, normal friends, and true, soul friends is about 60-30-10%. Over the years as I meet more and more people, it has become more like 75-20-5%. I suspect it’s about the same for other people too, with a variance of about 5-10%. No matter whether you just want to make normal or best friends, you can do that. You may not believe it, but I was a very quiet and secluded girl back during my primary and secondary school years. When I was in junior college, I maintained this seclusive lifestyle, though I began to speak up more. Entering university and later on P&G (my ex-company) made me more sociable. Today I run my blog and coach others through 1-1 coaching and workshops where I share a lot of my life to others. If the younger me had wondered what I would be like in the future, I wouldn’t never have thought that I would be as outward and expressive as I am today. If you take a look at the people out there who seem to make friends easily, they were probably seclusive themselves at some point. Their social skills were likely all picked up over time. For this same reason, you can learn to become more sociable through time and practice. The first step is to develop a healthy mental image of meeting new people. Some of us see meeting new people as a scary event. We are concerned about making a good impression, whether the other person will like us, how to keep the conversation going, and so on. The more we think about it, the scarier it seems. This initial apprehension develops into a mental fear, which takes a life of its own and unknowingly blocks us from making new friends. Shyness toward others is actually a result of fear. Actually, all these fears are just in our head. If you think about it, 99% of people are too busy being concerned about these very things themselves to pay attention to you. While you’re worried about the impression you make, they are worried about the impression they will make. Truth be told, they are just as scared as you are. The remaining 1% are people who recognize that a relationship is built on way stronger values than specific words or things said/done during just one encounter. Even if there are people who do judge you based on what you do/say, are these people you want to be friends with? I think not. Reach out to acquaintances. Have any hi-bye type friends from earlier years? Or friends you lost touch with over time? Drop a friendly SMS and say hi. Ask for a meetup when they are free. See if there are opportunities to reconnect. See if there are cliques you can join. Cliques are established groups of friends. The idea isn’t to break into the clique, but to practice being around new friends. With cliques, the existing members will probably take the lead in conversations, so you can just take the observatory role and watch the dynamics between other people. Get to know your friends’ friends. You can join them in their outings or just ask your friend to introduce you to them. If you are comfortable with your friends, there’s a good chance you will be comfortable with their friends too. Accept invitations to go out. I have friends who rarely go out. When asked out, they reject majority of the invites because they rather stay at home. As a result, their social circles are limited. If you want to have more friends, you have to step out of your comfort zone and go out more often. You can’t make more friends in real life if you stay at home! Once you acquaint yourself more with your inner circle of friends, the next step will be to extend to people you don’t know. Join meetup groups. Meetup.com is a great social networking site. There are many interest groups, such as groups for entrepreneurs, aspiring authors, vegetarians, board-game lovers, cycling enthusiasts, etc. Pick out your interests and join those groups. Meetups are usually monthly depending on the group itself. Great way to meet a lot of new people quickly. Attend workshops/courses. These serve as central avenues that gather like-minded people. I went to a personal development workshop last year and met many great individuals, some of whom I became good friends with. Volunteer. Great way to kill 2 birds with one stone — not only do you get to spread kindness and warmth, you meet compassionate people with a cause. Go to parties. Parties such as birthday parties, Christmas/new year/celebration parties, housewarmings, functions/events, etc. Probably a place where you’ll make a high quantity of new friends but not necessarily quality relationships. Good way to meet more people nonetheless. Visit bars and clubs. 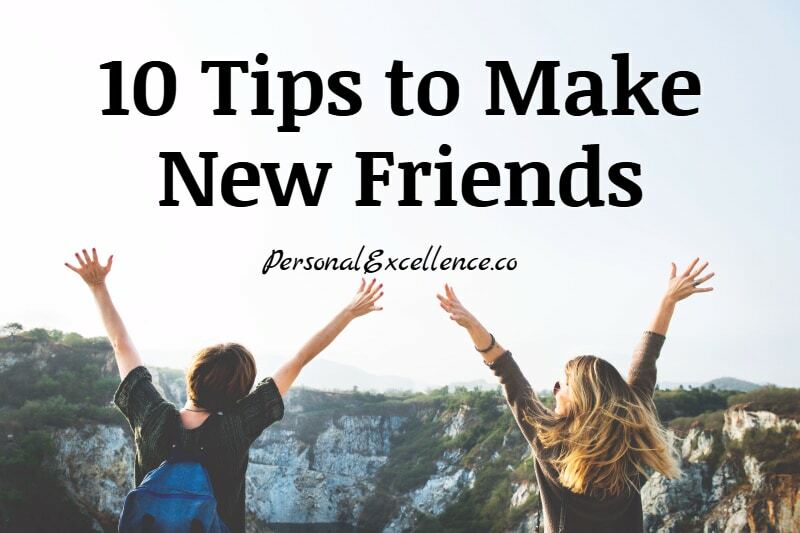 Many people visit them to meet more friends, but I don’t recommend them as the friends you make here are probably more hi-bye friends rather than type #2 or type #3 friends. It’s good to just visit a couple of times and see how they are for yourself before you make your judgment. Once you are out there with people around you, someone has to make the first move. If the other party doesn’t initiate a talk, take the first step to say hello. Get to know each other a little better! Share something about yourself, and then give the other party a chance to share about him/her. Something easy, like asking how the day is, or what they did today / in the past week is a great conversation starter. Once the ice is broken, it’ll be easier to connect. a) Be open-minded. Don’t judge. Sometimes you may have a preset notion of the kind of friend you want. Maybe someone who is understanding, listens, has the same hobbies, watches the same movies, has similar educational background, etc. And then when you meet the person and realize that he/she differs from your expectations, you then close yourself off. Don’t do that. Give the friendship a chance to blossom. More importantly, give yourself a chance with this budding friendship. I have several very good friends who come from totally different backgrounds, and I would never have thought that we would be so close when I first knew them, simply because we are so different. A good number of my ex-clients are people whom I’d never meet in normal circumstances given our diverse backgrounds, yet we get along extremely well, just like good friends. On the same note, open your heart to the person. This connection between you and the other party can only begin when your heart is open. This means to be trusting, have faith, and believe in the goodness of others. You can’t form any new connection if you mistrust others or you are fearful that things won’t work out. It’ll send the wrong vibes and cause them to close off their hearts to you too. What has he/she been up to recently? What are his/her upcoming priorities/goals? What does he/she value the most? What are his/her passions in life? Goals? Dreams? Often times we are too caught up with our own concerns — such as what others will think of us, what we should say next, what our next action is — that we miss the whole point of a friendship. You can work on the presentation aspects such as how you look, what you say, and how you say things, but don’t obsess about them. These actions don’t (truly) define the friendship. What defines the friendship is the connection between you and the friend. Show warmth, love, and respect toward everyone you meet. Do things because you want to, and not because you have to. Care for them like you would yourself. If you approach others with genuinity, you will attract people who want to connect genuinely. Among them will be your future true friends. Don’t change yourself to make new friends. That’s the worst thing you can do. Why do I say that? You change back to the introverted you. However, your friends will feel cheated because this isn’t the person they befriended. They’ll also gradually shift away if your personalities don’t match. So, just be yourself. That way, potential new friends will know you as you, and they’ll use that to decide if they want to take the friendship a step further. I don’t think there’s a need to be outward and articulate like Tony Robbins to get friends. It’s all about being you. The truest friendships are built with both parties accepting each other for who they are. A friendship is a supportive union between two people. Be there for your friends where you can. Does any of your friends need help currently? Is there anything you can help them with? How can you better support them? When you help your friends, don’t do so with the expectation of being helped next time. Rather, help unconditionally. Treat them with emotional generosity. Give because you want to, not because you feel obliged to. I find that the satisfaction I get from helping others and knowing they are better off is a reward greater than anything I can get in return. At the end of the day, continual effort is required to maintain the friendship. Willingness to make the effort is what differentiates great friends from hi-bye friends. Ask your friends out every once in a while. Depending on the intensity of the friendship, there’s no need to meet up every few days or once a week — catching up once a month or once every few months might be sufficient. The strength of your relationship is not measured by how frequently you meet. For some of my best friends, we meet only once every few months. Yet, there’s never any doubt that we’re closely connected and we will be there for each other when needed. If both of you have your own set of engagements, it may be hard to find time together. Arrange for a simple meetup, say over lunch, tea, or dinner time. Or you can always catch up over text messages, online chat, or phone calls. Technology has made communication so easy that it’s difficult not to stay in touch. I hope you’ve found these 10 tips useful. 🙂 Which can you apply to make new friends right away?